Apple’s Mac App Store launched yesterday and news around it have been pouring. So, it’s time to take a quick look at the important stuff around the App Store. Apple loves showing off numbers. And they came out and said that they have had 1 million software downloads in just 24 hours. CUPERTINO, California—January 7, 2011—Apple® today announced that over one million apps have been downloaded from the Mac® App Store℠ in the first day. With more than 1,000 free and paid apps, the Mac App Store brings the revolutionary App Store experience to the Mac, so you can find great new apps, buy them using your iTunes® account, download and install them in just one step. That is just incredible. We will have to wait and see if the momentum continues as there are some major hurdles. We’ll come to that soon. Also, there wasn’t a breakdown on how many free and paid apps were downloaded. 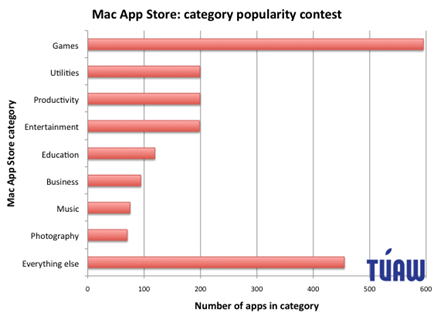 TUAW has come up with a nice graph on the split of apps in various categories. Most apps seem to be games and most apps seem to fall in the price range of $20-50. It is also good to see a healthy size of free apps. So, you have downloaded a few apps from the new Mac App Store. While you are browsing through the store, you might have noticed that some of the apps you own already show up as ‘Installed’ while some others don’t. This is to be expected. TUAW has a detailed post on this topic. I think this could be solved with developers issuing free promo codes (when this becomes available) for previous software license owners to streamline their users into App Store. 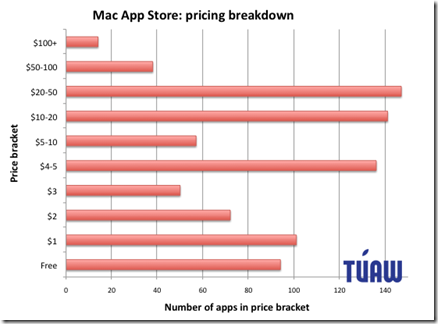 Apple has discounted heavily on its flagship photography software – Aperture. It is now just $80 against the original price of $199. That’s even cheaper than Amazon ! Lifehacker has a nice article on the shortcomings of the App Store. It is a good read to see why the iPhone App Store model doesn’t work too well for Mac software. They also have an article on why you might like the App Store in the long run. Does this mean the whole desktop software industry needs a different mind set? Or maybe the software app stores need to be flexible keeping the traditional model in mind?